Saucy chicken, gooey mozzarella cheese and tender squash, all on one pan.This quick weeknight meal will be ready in no time and has minimum clean up! Try it today with our new Organic Basil Pasta Sauce or your favorite Francesco Rinaldi Sauce. On a clean cutting board, slice one chicken breast horizontally into two thin pieces. Repeat for the second chicken breast. Place the chicken on a paper-towel lined plate and pat dry with more paper towels. Set aside. In a medium-sized dish combine the all-purpose flour, ½ tsp. salt, and ¼ tsp. black pepper. Mix well. In a separate medium dish combine the eggs and water. Whisk until the eggs are one smooth homogenous mixture (about 1 minute). In a separate medium dish combine the panko breadcrumbs, crushed Ritz crackers, grated parmesan cheese, and 1 tsp. Italian herb seasoning. Mix well. Three Step Breading Process: Dredge both sides of each piece of chicken in the flour mixture. Shake off any excess flour. Dip it into the egg mixture making sure to coat all sides. Immediately move to the panko/cracker mixture and press fairly firmly. Make sure to flip the chicken to get as much breading as possible onto each piece. Place each coated piece of chicken in the center of a foil lined and pan-sprayed sheet tray. Set aside. To prepare the roasted vegetables, mix the sliced zucchini and summer squash in a large bowl with the oil, Italian herb seasoning, ¼ tsp. salt, and 1/8 tsp. black pepper. Mix well. 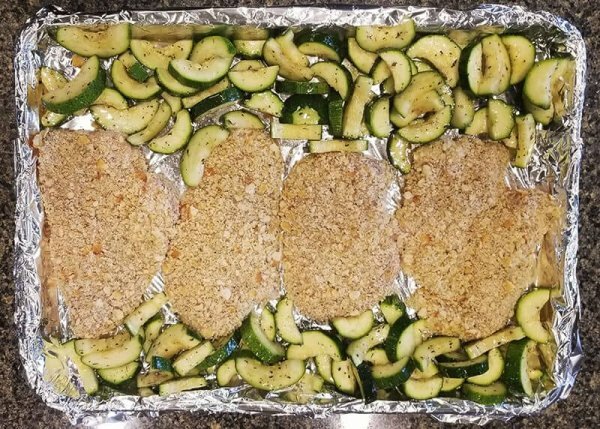 Place vegetables on the sheet tray around the breaded chicken. Bake for about 25 minutes, occasionally stirring the vegetables. After the initial 25 mins, flip the chicken and stir the vegetables again. Bake an additional 15-20 minutes or until the internal temperature of the chicken reaches 165 degrees F.
Remove the sheet tray from the oven. Remove the vegetables from the sheet tray and place into a serving dish. 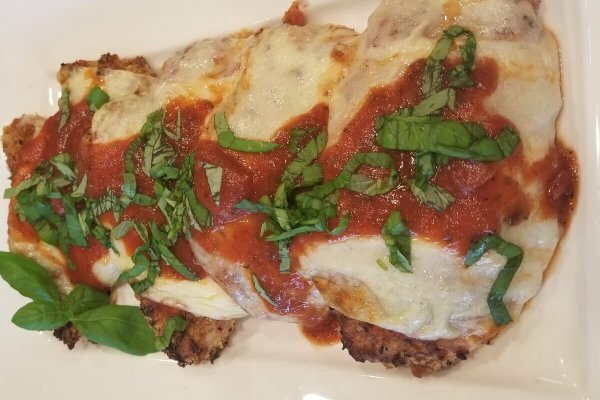 Top each piece of chicken with some Francesco Rinaldi Organic Basil Sauce. Place two slices of mozzarella cheese on top of each piece of chicken. Turn oven on broil and broil until cheese is melted, bubbly, and lightly starting to brown. Serve with more pasta sauce and shredded fresh basil if desired.